His Booker Prize finalist Harvest strands readers in a nameless, timeless place—in part to show why place matters. On a Thursday afternoon in August, the deadest of months, the British novelist Jim Crace tweeted. Well, The Paris Review tweeted for him. I was halfway through Crace’s 11th and most recent novel, Harvest—and in need, I admit, of a little egging-on to persevere. So I concluded this (totally incomprehensible) tweet could be only one thing: an omen. I was not alone in looking for signs. For over a month now, London bookies have been betting on who will win this year’s Man Booker Prize. Many have wagered on Harvest as a front-runner, and today it made it onto the shortlist. For Crace, this moment is especially ripe for such divining. In 1997, his fourth novel Quarantine was short-listed, but ultimately lost the contest. More than a dozen years and half a dozen books later, Crace (who is 67) professes this novel will be his last. If that’s true, Harvest is his final chance to win. Crace’s “trick of fiction” (logs! donkeys!) is bizarre in a way that Twitter, home of the quirky non-sequitur, often embraces. It is the kind of thing I might have retweeted. But the truth is that I was tired of not understanding Jim Crace. Mired in Harvest, I needed this tweet to do more than titillate—I needed it to elucidate. “Craceland” is notoriously—probably intentionally—hard to navigate. With the exception of only two books, Crace’s novels take place in a nameless, timeless, and sometimes charmless geography. The scenery of Harvest is agrarian and remote, a tiny village catalogued in exhaustive detail but surrounded by a vast unknown full of mysterious menaces. It is probably somewhere in or near England. When the book takes place is even harder to tell. The Man Booker website confidently says it’s the 18th century; one reviewer guesses the 16th century, while another suggests a mauve garment dates it to the second half of the 1800s. Harvest’s tour guide is protagonist Walter Thirsk, an unlikely migrant to this secluded haven, where everyone else has been around for as long as memory holds—and has blonde hair and big bones to prove their stock. Walter takes the reader through his master’s manor house and his neighbors’ huts, to the acres where barley is sown and the marsh where dead bodies are discarded. And he narrates in measured tones as the insulated village is threatened by outsiders and begins to go up—quite literally—in flames. So one thing I do understand about Crace is the trickiness of his fiction. Readers must plunge into a world that is at once obsessively specific (it’s hard to pay attention to each stalk of barley Crace describes) and troublingly vague (it’s hard not to wonder about the whole wide world Crace decides to leave out). 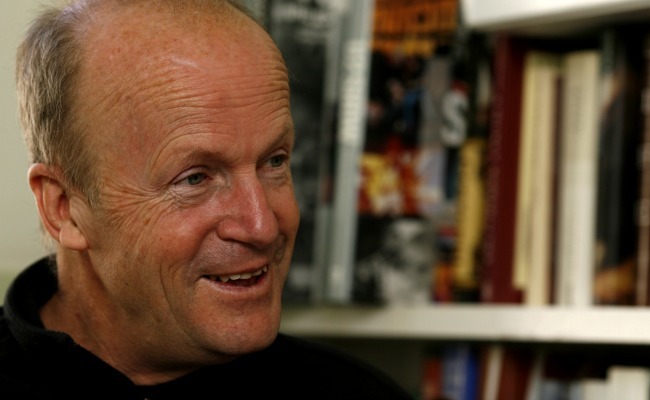 This is where the tweet comes in: 69 characters that might explain what Jim Crace is up to. The snippet comes from a long and insightful interview with The Paris Review. As Crace tells it, he discovered “the trick of fiction” while traveling in the Judean desert and researching Quarantine, which reimagines Jesus’ 40 days of wasteland wanderings. One morning, Crace remarked to his Bedouin guide that he had slept like a log. “As I said it,” he recalls, “I saw his eyes narrow and I looked over his shoulder into the desert. Not a single log! All I could see, maybe a kilometer away, was an old tumbled thornbush.” Meanwhile, the guide happily reported he had slumbered like a “dead donkey”—a much more familiar image in log-less terrain. The simplest takeaway would be: Make sure you get your facts—and your words—right. Logs must morph into donkeys to ensure an accurately rendered (and resonant) fictional world. This is the line of thinking I once heard from a novelist who was determined to find out whether grocery bags in the 1950s had handles or not: Her characters had to be credible at the supermarket, too. What’s strange is that this isn’t Crace’s philosophy at all. He puts it bluntly: “I don’t want facts.” He constantly invents trivial details, like the names of a tool or an animal—things a reader would neither suspect as inaccuracy, nor register as fantasy. The real point of Crace’s tweet is that he believes geography—whether it’s woody England or thornbrushy Judea—determines just about everything. Harvest is a confusing combination of moral allegory and political commentary. But it is also, more simply and powerfully, an ode to place. Every feature of Crace’s village—the pillory where a criminal is chained, the rickety bed where a widow sleeps, the ditch where everyone poops—is described with an intense specificity that is practically loving. At one point, Walter Thirsk is overcome by affection for a badly built tool shed. This might sound saccharine, but it’s not; it’s beautifully reverent. It is no coincidence that the book’s most alluring character creates maps. The mathematical task of surveying a place becomes, in Crace’s hands, a work of art. In Craceland, newcomers like me may find this attention to detail a lot to plow through. Halfway in, I was sick of being stuck in the minutiae of village life. But there’s a reason Crace never lets us glimpse the mapmaker’s aerial view. It was on the ground that I discovered Crace’s greatest gifts with language, and was finally sucked into his peculiar world. He makes the reader look, and keep looking, until the logs have not only become donkeys, but have truly come to life. This is not the work of someone with “tricks” up his sleeve; this is the work of a master—and perhaps a prize winner.